From its start in 1963 with a procession including 20 of the total 100 boats that were then docked in the brand-new harbor at Marina del Rey, the boat parade has flourished, becoming one of the largest in Southern California with among the highest attendance figures. Fifty years ago, boaters such as Margie and Steve Bragg were responsible for facilitating the parade and helping it become the popular event it is today. At the time, the entry fee was $2, and the total parade cost was about $60, because nearly everything was done by volunteers. Donations covered all expenses other than printing of the entry forms. Today, the parade features between 50 and 100 boats taking a route around the harbor — and passing before crowds of spectators on shore and aboard nearly 4,500 boats docked in Marina del Rey. 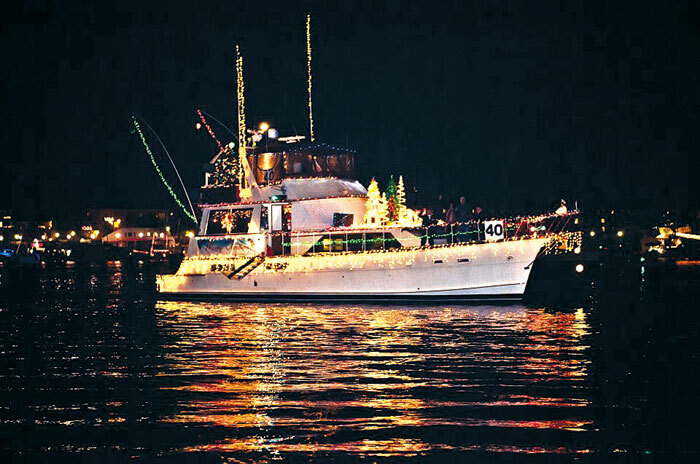 As the parade has grown in popularity, the boats’ holiday light displays have become more elaborate, with music, timed lights, animation and even fog machines. All boats circle the main channel of the Marina del Rey harbor at least three times. The south turn is parallel to Pacific Avenue in Marina del Rey and the jetty bridge in Playa del Rey. The north turn is at the end of “F” Basin. Just prior to the start of the parade, fireworks will be launched beyond the south turn of the parade, from the jetty on the Playa del Rey side of the channel. The 50th “Solid Gold” anniversary edition of the parade is lining up to be “a hit,” organizers said. For more information on the Marina del Rey Holiday Boat Parade, call (310) 670-7130 or visit mdrboatparade.org. Start early. As soon as the theme is announced, it’s time to assemble your planning committee. Planning and design can be a lengthy process. The more categories you cover when designing your boat, the better chance you’ll have of winning. Start with something simple. Remember, you only have to decorate one side of your boat. Also, keep in mind the more extravagant your plans are, the more crew you will need. Make sure your decorations do not impede your ability to see where you’re headed or to maneuver the boat. Everything must be firmly attached. Have sufficient electrical power on board — and have a sufficient number of fire extinguishers in proper working order. Before you start building your display, make a list of materials you expect to use — and then, buy them all in one convenient trip. Animation can be complex and expensive, or it can be as simple as a crewmember pulling a line to make something move. Remember, you will have to repeat your animation over and over. Music is important. Record music that fits your decorating theme, and the season. Make sure to comply with all the rules and regulations that are spelled out by parade organizers. Be alert at the helm and maintain an adequate distance between you and the boat ahead. Leave the partying and drinking for later, when you are back in the slip.